As was discussed in my 4 part interview that I recently posted on our new soft tissue management system, FUNCTIONAL RANGE RELEASE™, research, and thus our focus has moved away from the treatment of muscular tissue and on to that of the more dynamic tissue, fascia. The argument that I offer is that muscle is simply a collection of proteins (actin, myosin, etc.). These proteins are surrounded entirely by connective tissue that separates them into identifiable fibres, then bundles that increase in size to form the entire ‘muscle’ structure. This connective tissue/fascial lattice then continues from the ends of these bundles to form tendons to make bony insertions, and also fascial connections to many other soft tissue structures. 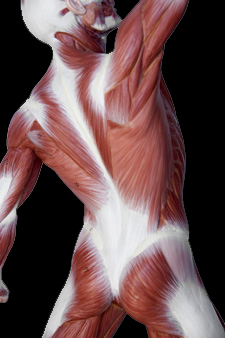 Fascia is a tough connective tissue surrounding every muscle, bone, nerve, blood vessel, and organ of the body, down to the cellular level forming a web from head to foot without interruption. The goal of soft tissue therapies has never been to tear muscle proteins apart. It has been to remove restrictive scar tissue, or fibrosis which is formed by, and within in fascia. I therefore conclude that the soft tissue therapies that target muscle structure have been ‘shooting’ at the wrong target. It would be easy to then assume based on the argument above that the soft tissue therapies currently being utilized have been working on the fascia all along. However this assumption is incorrect. This is because the research that has been performed on this amazing organ demonstrates that it does not respond in the same manner as muscular tissue. Thus many changes in soft tissue application must be made in order to expect induce permanent, favorable changes in fascial structure with soft tissue application (for more on this, please refer to the 4-part interview on Functional Range Release™ which can be found here). Here is a little quiz to test your knowledge on Fascia and the way in which it responds to external force/load application. The answer key can be found on our FACEBOOK Page under ‘Discussions’ for Aug 11, 2010. 1. The fascia of the human body is comprised of which three basic elements? 2. The main function of ___________ is to maintain the structural integrity of connective tissues by continuously secreting precursors of the extracellular matrix. 3. The transformation of fascia from a more dense ‘gel’ state to a more fluid ‘sol’ state is termed Thioxtrophy. Application of external force must be maintained for a minimum of how long in order to induce plastic changes in fascia by way of Thioxtrophy? 4. Pressure from an external source creates a higher electric charge, which then stimulates the fibroblasts to increase their production rate of collagen in that area. This phenomenon is known as? 5. True or False – approximately 10% of classical acupuncture points in traditional Chinese acupuncture occur where a triad of a vein, artery, and nerve (an unmyelated autonomic nerve) perforate the superficial fascia layer. 7. Studies have shown that fascia is rich with mechnoreceptors. One such receptor, the ______________ are activated by slow and deep soft tissue techniques. These receptors are of great interest as their stimulation results in a lowering of sympathetic nervous system activity. 8. Stimulation of fascial mechanoreceptors can lead to changes in muscle tonus which is set by the _____________ system.